Refer to table R of appendix II for a trouble-shooting chart covering the maintenance of ranges, ovens, and broilers. As a Utilitiesman, you need to know how to maintain, repair, and troubleshoot the field range. Unfortunately, this manual can NOT cover all you need to know about the field range; therefore, you should have your supervisor refer you to other sources of pertinent information. A gas-fired field range is shown in figure 5-6 and the procedures for setting up and operating the range burner unit is detailed in chapter 2, Utilitiesman Basic, volume 1, NAVEDTRA 11019. Keeping the field range in a constant state of readiness is important to everyone in the field. This is accomplished by performing preventive maintenance checks and services quarterly or after every 250 hours of operation, whichever occurs first. Table R of appendix II provides a listing of possible malfunctions that may occur in the field range outfit. This listing will help vou in diagnosing and correcting unsatisfactory operation or failure of the field range outfit. Also, an excellent source of information is listed in the references listed in appendix IV. Figure 5-6. 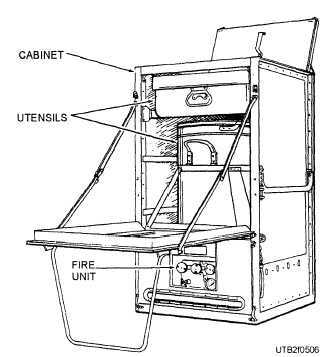 - Field range with fire unit in position for cooking. Routine maintenance of bakery ovens (fig. 5-7) requires weekly, monthly, and annual inspections. Adjust the heating units for proper fuel-air mixtures and constant operating temperature. Check the pilot flame of the gas-fired ovens and adjust it, if necessary, so the burner gas ignites without wasting fuel and the flame is not blown out by the flue draft. Adjust the fuel-air mixture to produce a blue flame. Check the operation of the purging fan and the flame failure devices. Clean the soot and dirt from the pilot and gas burner. Check the oil supply for eaks and stoppages and clean the strainer basket of oil-fired ovens. Examine the operation of the electric-ignition and flame-failure devices, and repair them if necessary. Adjust the oil burner for proper spread of fuel across the combustion chamber and for proper fuel-air mixture to maintain a blue flame. Examine the operation of dampers and clean and adjust them if required. Check the settings of automatic temperature and humidity controls; reset the settings of the thermostat and humidistat if necessary. Inspect the conveyor and drive and adjust loose chains, belt tension, and any other component that may be misaligned. Adjust the chains of the V-belt tension by moving the idler sprocket or sliding motor base. Check the lubrication of gearboxes, bearings, and moving parts. Examine the oven top and walls for cracks and breaks; make the repairs if necessary to ensure tightness.